We Nordics have a favourite pass time: to try and get non-liquorice lovers to taste the stuff we enjoy eating by the bucket load. We cannot comprehend why you do not enjoy these (usually) super salty and often peppery sweets. To be fair, we are aware that liquorice is one of those tastes that have to be developed over time. The enjoyment of liquorice (to us) start in the sweetie shops when we’re kids and it grows over a great number of years. By the time we’re adults, we’re so accustomed to the taste of salty liquorice that we can eat the liquorice-equivalent of crack and still think straight. Most likely, we can consume bags at the time. First, the nature bit: Liquorice comes from the liquorice root. It’s a plant that has medicinal powers known for centuries. Admittedly, commercial liquorice isn’t that similar to the root. However, did you know that pure liquorice is actually 20 times sweeter than sugar? Liquorice is popular all across the world but especially in Europe. The further North you go, the saltier we like it. The Nordic countries as well as the Netherlands, seem to have developed the taste for the particularly Strong Black Stuff. Many believe this is because the salty/sweet combo is very much part of our food heritage. When you talk about Salty Liquorice, what we usually mean is Salmiakki. The word Salmiakki is a Finnish word and we prefer using that because the actual word is Ammonium Chloride, which doesn’t sound so nice. Ammonium Chloride is a powder that taste like salt, but isn’t really actual salt as you know it. It’s this stuff that gives some of our liquorice the distinct edge of saltiness. But let’s just call it Salmiakki, shall we? Or saltlakrids, if you want to be specific about it. The way to start appreciating liquorice is to start with the mild stuff then slowly move towards the saltier varieties, much like you would when enjoying spicy foods. There are many varieties of liquorice – from the gourmet to the less gourmet, from the mild to the super strong… Where to start? Here’s our mini-guide to some of our favourite liquorice – and a guide to the strength, as measured in good old skulls. Our favourite has to be the gourmet liquorice by Danish maker Johan Bülow. When we say gourmet, we really do mean gourmet: hand made using the finest raw ingredients. Not strong, just very fine liquorice. No skulls – this stuff is very mild, although Liquorice number 5 does have a good kick at the end as it has added chilli. For beginners, try number one – the sweet one. Tyrkisk Peber. The most infamous of Nordic liquorice, these babies come in the original super hot flavour (boiled sweets with a peppery inside). We also love the Firewood selection: chewy, but less strong. Still, we rate both as 3-skull due to the consistent salmiakki delivery while eating. if you get hold of a few bags of the blue one, crush the sweets then add them to a bottle of vodka. Leave for a week or so to marinade – and voila! A very salty pepper shot. Also know as ‘Little Grey Ones’ in Denmark (‘Små Grå). Lakrifun / Skolekridt. A firm childhood favourite, these little sweet ‘chalks’. The liquorice centre is sweet with a slight hit of salt. Coated in a white sugary glaze. A great sweet – most people will admit to liking this after a few tries. Djungelvraal – literally, JungleScream. Sweet liquorice covered in salmiakki. Initially the shock is a 3 skull taste – but quickly you will realise it is just the coating. If you can take the initial ten seconds, you can join the club. The rest is easy. 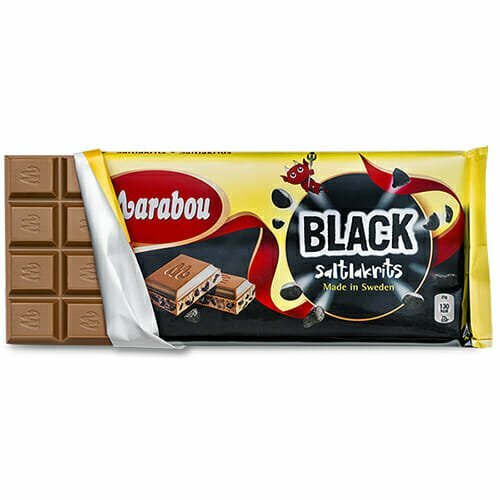 Marabou Black – yes, chocolate with liquorice in it. Also available in the Salmiakki version by Fazer. Eating chocolate and salty liquorice together is something only true lakriphiles do. The liquorice enjoyment is long, drawn out and constant. Not strong, just very liquorice. Is it really called lakriphile? Lakrisal -little liquorice powder tablets. A bit of a kick, but nothing serious. A good salmiakki starter. 1-2 skulls. Super Piratos – salty liquorice coins. Actually, this is the extra salty version. If you can eat this, you’re in the club. 3 skulls. Franske Saltpastiller – French salt pastilles. Also a good beginner at 1 skull strength. 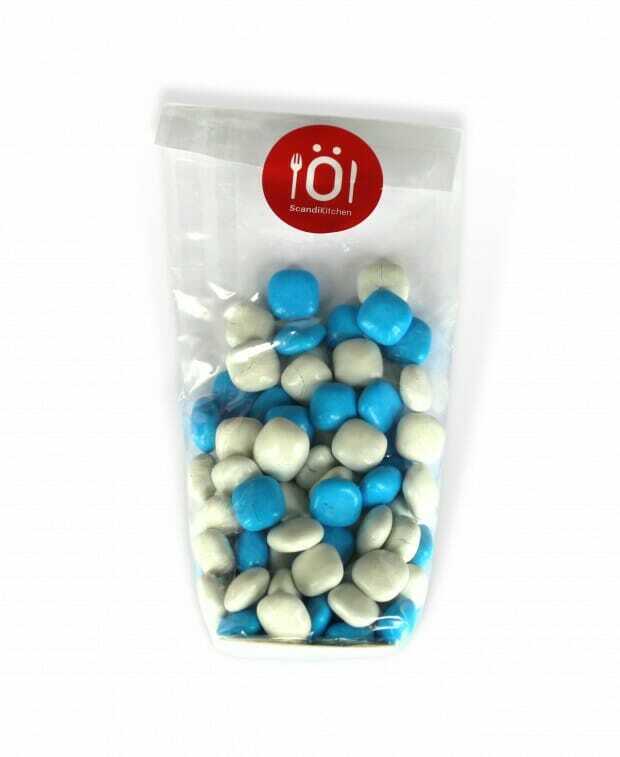 Blue and white coated sugar sweets with slightly salty liquorice inside. Chewy. Not really French; doesn’t even know how to ask for directions to the nearest Metro. Liquorice pipes – under threat from the EU and might be banned, the pipes are sweet and not strong. And a bit fun, too. One skull strength. Great for starters and for pretending you are some kind of weird liquorice pipe eating pirate or sailor. Salty Fish – those Swedish Fish, but the liquorice version. 1 skull strength with a nice salty finish. A good beginner fish. We’re celebrating a bit of a liquorice week at ScandiKitchen Cafe starting 31st January. Pop by and have a few tasters, chat to us about the strong stuff and get advise on what to try. We’ll be most happy to try and help you develop your own liquorice addiction. Click here to shop for liquorice in our online store.